Jellyfish Art is San Francisco-based purveyor a of fine jellyfish and aquariums. 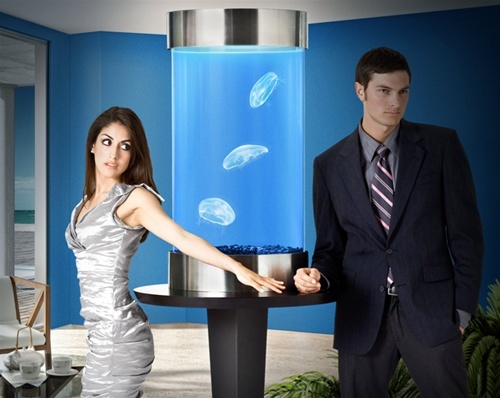 They offer desktop aquariums, but for the discerning jellyfish enthusiast, witness the Monaco, a 40 gallon cylinder of aquatic luxury. The price? $2,900. Jellyfish are becoming the next trend in ornamental aquariums and Jellyfish Art is the leader in supplying live jellyfish and their specialized aquariums and products. Their mesmerizing forms and soothing movement create living works of art.